The largest Pride celebration in Western Canada is back as Vancouver Pride Week brings rainbow-coloured smiles to Vancouver streets. Modo is proud to support this community tradition, and we hope you'll join us – along with hundreds of thousands of cheering onlookers – at the annual parade in celebration of a healthy, connected and inclusive city! 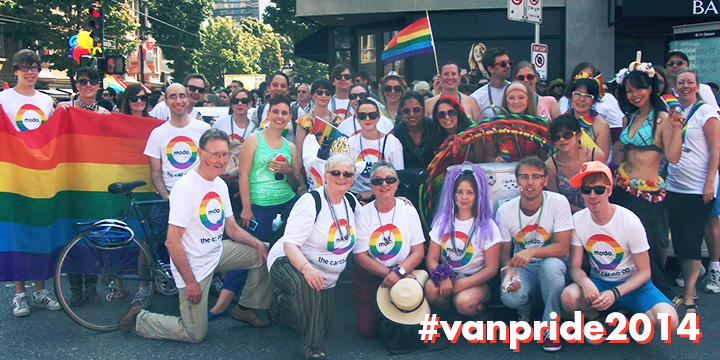 March in the Pride Parade with Modo staff and members this Sunday, August 3! There's no limit to how many can join, so bring your friends and fam (non-members too!) to walk, rollerblade, hula hoop and bike with the Modo float. If interested, email tommy@modo.coop for meet-up details (last minute is no problem). If you're looking for a good spot to watch the parade, find the route online. It runs through the heart of the West End so if you have a local Modo booked that day, expect traffic and transit delays, as well as parking restrictions. Be safe, have fun and happy pride! >> PENTICTON If you haven't visited this cute beach town, read Kate and Dani's #LetsModo post and get the inside scoop. >> DESTINATION BEACHES With only a few weeks of great beach weather left, it's high time you discovered these lesser-known beaches! >> VOLUNTEERS NEEDED Donate 3 hours to our pals at the West End Seniors Network as a volunteer driver! >> RICHMOND EATS From fresh seafood to comfort food, Richmond is a foodie haven. Book a Modo down the 99 to these trendy spots! >> SUMMERLAND New Modo member Chris Bentzen from Hot Art Wet City documents his #LetsModo road trip to Summerland – check it out! Please join us in giving a big Modo welcome to new Member Care manager Nicole Huk! 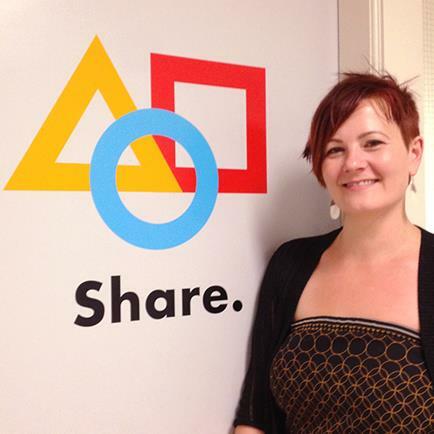 An SFU alum, Nicole was Operations Manager at Victoria CarShare before joining Modo. There, she utilized her passionate, innovative approach to client service to help grow the co-op. Off hours, Nicole can be found at a yoga class, learning a new skill, hunting down Jimmy Choos, or with friends on a patio (usually in the West End!). "I really enjoy creating solutions and developing a team, and I'm thrilled to bring my experience to Modo!" To take advantage of this offer, email freestuff@modo.coop with the subject line #FESTIES. Know someone who's thinking about joining Modo? Get a $25 referral credit for every friend who becomes a member! GAS Fill the tank before it hits 1/4 tank. Use the fuel card only at the pump; hit a set amount, such as $60, never "fill up"; and just say "no" to a receipt. TIME A common newbie mistake is underestimating how long you'll need your Modo, resulting in late fines and inconvenience to other members. So give yourself plenty of time to get there and back – and get gas if needed. You can always end your booking early, via smartphone or calling us at 604.685.1393. REPORTING We rely on members to be our eyes and ears when operating Modo's member-owned carshare fleet. Be a good sharer and report damage, dirty interiors/exteriors and inconsiderate member behaviour by phoning us at 604.685.1393. Photos also help! Send to info@modo.coop. MODE-SHARING Get to know Modo's diverse fleet of cars, trucks, vans and electrics, and save time and money by mode-sharing to access vehicles along rapid transit lines. For example, Skytraining from Vancouver to pick up a vehicle in Surrey on the way out to Ladner could save an hour-plus in rush hour traffic and make for a more pleasant trip. Find more pro-tips on Modo's blog: modocoop.tumblr.com/tagged/pro-tip. Happy sharing! 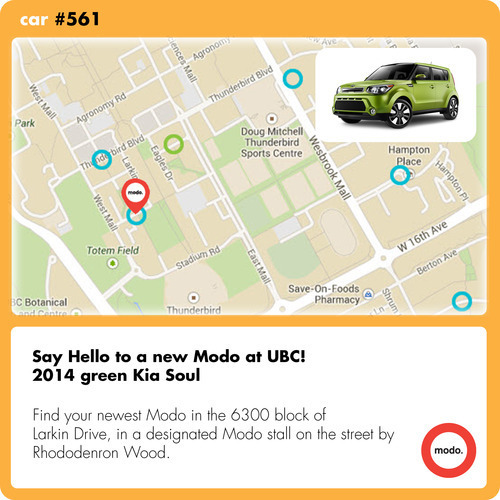 Find a 2014 green Kia Soul (#561) in the 6300 block of Larkin Drive, in a designated Modo stall on the south side of the street. If you're coming from West Mall, ours is the last stall on your right before Rhododendron Wood. Find a 2014 blue Nissan Versa Note (#560) in front of 5788 Birney Avenue, half a block east of Wesbrook Mall in a Modo stall across from the Keenleyside building. A 2014 red Fiat 500L (#529) will temporarily live in the 6400 block of Ash Street, one block west of Langara SkyTrain station. Park in the permit zone across from Tisdall Park, in front of the townhouses if possible. We've upgraded this location to a 2014 grey Dodge Grand Caravan (#564) instead of a 2007 Toyota Corolla. Find a 2014 grey Nissan Sentra (#566) and a 2011 blue Mazda 2 Hatch (#360) in the parkade of Vancity on W 10th Avenue. Follow the ramp down to the first level and find the Modo stalls on the right side. We've added a new cargo van to our fleet! Find a 2014 white Nissan NV200 Cargo Van (#565) in the large lot at W 10th Avenue and Cambie Street. Find a 2014 yellow Toyota Prius C (#549) in front of 2460 East Georgia Street, between Nanaimo Street and Kamloops Street. Find a 2014 blue Nissan Versa Note (#545) in a designated stall on the east side of Laguna Court, just south of Quayside Drive. Find a 2014 white Nissan Versa Note (#557) on the east side of Eleventh Street in a designated stall, just south of Auckland Street. Find a 2014 red Kia Soul (#554) behind the Rexall Drugs at 700 Sixth Street. Look for our stall next to the loading zone of the building, just off Seventh Avenue. Find a 2014 grey Nissan Sentra (#559) in a designated stall on the north side of Royal Avenue, just east of Sixth Street, next to the green space in front of New Westminster City Hall. Learn all you wanted to know about electric vehicles in BC with our friends from Emotive BC! Find them near the main stage at the Richmond Night Market throughout the weekend. >> Want to join Modo in the parade? Email Tommy (tommy@modo.coop) to march with Modo! We're thrilled to be market sponsor for the Kits Farmers Market this year! Find some of the best, fresh local produce around and enjoy some great local music. Bike valet available every week. Open 10–2pm. Now located at the Surrey City Hall Plaza, the SUFM is a great place to pick up a fresh, local lunch or an early dinner, along with fruit and veg for the week. Conveniently located next to Surrey Central SkyTrain, bus loop and several Modo vehicles! Open 12–5pm. 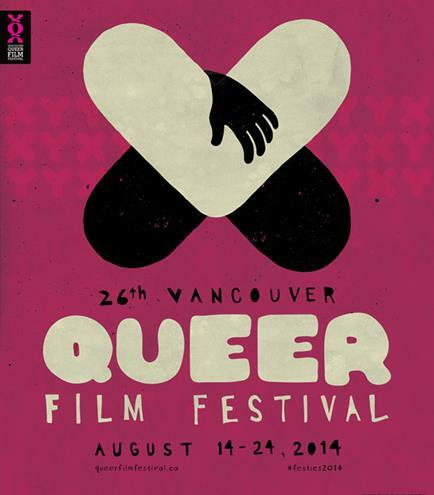 Celebrate the 5th anniversary of New West Pride with an expanded festival and location change! Columbia Street is the new festival home and host to the New West Pride Columbia Street Party. The Mount Pleasant Business Improvement Area hosts this community festival and Smoking Sausage BBQ Competition Cook-Off tol celebrates a shift in seasons, urban gardening, sustainability and eating locally. Open 12–6pm on Main Street, between Broadway and East 7th Avenue; BBQ Cook-Off 2–5pm. Proceeds go to Greater Vancouver Food Bank.